Access to contraceptive services and maternal and newborn health care is critical for women’s health, as well as their social and economic well-being. Increased investment is essential to ensure that Nigeria’s commitments are met and that women have access to the information and services they need to determine whether and when to become pregnant. Of the 45 million women of reproductive age (15­–49) in Nigeria, 15.7 million want to avoid a pregnancy; that is, they are able to become pregnant, are married or are unmarried and sexually active, and do not want a child for at least two years. Women wanting to avoid a pregnancy who are not using a modern method are considered to have an unmet need for modern contraception. Of the 9.5 million women with unmet need, 7.0 million use no contraceptive method and 2.5 million use traditional methods, which typically have low levels of effectiveness. Among women wanting to avoid a pregnancy, the proportion with an unmet need for modern contraception is much higher among women living in households in the poorest wealth quintile than among women living in households in the richest quintile (92% versus 45%). Of the estimated 10.3 million pregnancies in Nigeria, 24% were unintended (i.e., unwanted or not wanted in the next two years). Women with an unmet need for modern contraception accounted for 90% of all unintended pregnancies. More than half of unintended pregnancies in Nigeria end in abortion. Many of the 7.4 million women who give birth each year do not receive the essential components of maternal and newborn care recommended by the World Health Organization and the Nigeria Ministry of Health. For example, 50% do not receive a minimum of four antenatal care visits, and 63% do not give birth in a health facility. The large majority of women living in households in the poorest wealth quintile did not receive a minimum of four antenatal care visits (84%) and did not deliver at a health facility (94%). In contrast, 12% of women living in households in the richest quintile did not receive four antenatal care visits and 19% did not deliver at a health facility. Each year in Nigeria, 61,000 women die from complications of birth, abortion or miscarriage, and 255,000 newborns die in the first month of life. Most of these deaths could be prevented with adequate medical care. Of the two million women and 2.8 million newborns in Nigeria who require care for medical complications related to pregnancy and delivery, only 17% receive the care they need. If all unmet need for modern contraception in Nigeria were satisfied, unintended pregnancies would drop by 77%, from 2.5 million to 555,000 per year. As a result, the annual number of unplanned births would decrease from 885,000 to 200,000 and the number of abortions would drop from 1.3 million to 287,000. If full provision of modern contraception were combined with adequate care for all pregnant women and their newborns, maternal deaths would drop by 68% (from 61,000 to 19,000 per year) and newborn deaths would drop by 85% (from 255,000 to 38,000 per year). The 2018 estimated annual cost of providing contraceptive services to the 6.2 million women of reproductive age in Nigeria who are currently using modern methods is US$67 million. This includes direct service costs for drugs, supplies and personnel, as well as estimated indirect (program and systems) costs. Meeting the need for modern contraception among all women in Nigeria who want to prevent a pregnancy would cost $546 million annually, an increase of $478 million over current costs. This additional investment would provide improved quality of care for current users and coverage for new users. 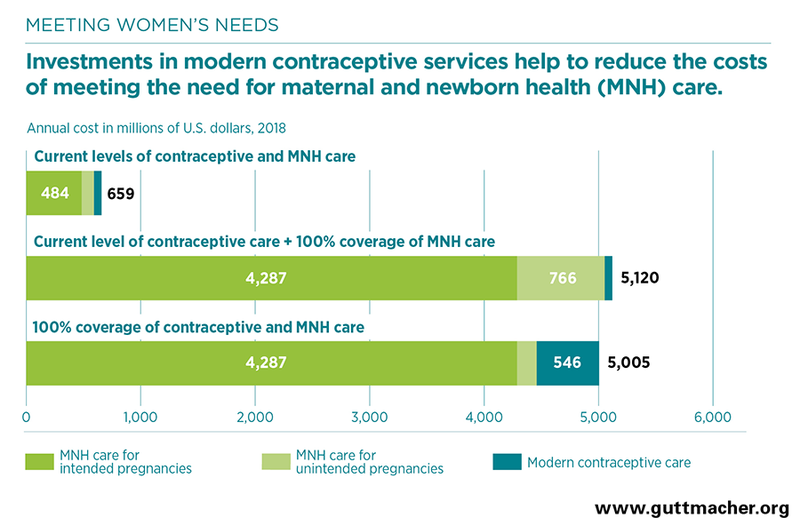 Maternal and newborn care at current levels costs $591 million annually—$484 million for care related to intended pregnancies and $107 million for care related to unintended pregnancies. Fully meeting the current need for maternal and newborn care without increasing contraceptive use would cost $5.1 billion annually. However, if all need for both contraception and maternal and newborn health care were met, the cost of maternal and newborn care would be reduced to $4.5 billion. Because the cost of preventing an unintended pregnancy through use of modern contraception is far lower than the cost of providing care for an unintended pregnancy, for each additional dollar spent on contraception would reduce the cost of maternal and newborn health care in Nigeria by $1.24. Fully meeting women’s needs for both contraceptive services and maternal and newborn health care in Nigeria would cost a total of $5.0 billion each year—$26.09 per capita—a total that is roughly the same cost as meeting the need for maternal and newborn care alone. Invest in meeting the need for modern contraceptive services and maternal and newborn health care to improve health outcomes. Investing in both sets of services is more cost-effective than focusing on maternal and newborn health alone. In addition, it has enormous benefits for women, families and society, and it would likely contribute to Nigeria’s progress towards achieving goals set at the national, regional and global levels. 1. Family Planning 2020, Nigeria, 2018, http://www.familyplanning2020.org/nigeria. 2. Federal Ministry of Health, Federal Republic of Nigeria, National Reproductive Health Policy, 2017. 3. Special tabulations of data from the 2013 Nigeria Demographic Health Survey. 4. Ganatra B et al., Global, regional, and subregional classification of abortions by safety, 2010­–14: estimates from a Bayesian hierarchical model, Lancet, 2017, 390(10110):2372–2381. 5. Stover J et al., Interventions to improve reproductive health, in: Black RE et al., eds., Reproductive, Maternal, Newborn, and Child Health: Disease Control Priorities, Washington, DC: International Bank for Reconstruction and Development and World Bank, 2016, pp. 95­–114. 6. Afolabi BM et al., Knowledge, non-use, use and source of information on contraceptive methods among women in various stages of reproductive age in rural Lagos, Southwest Nigeria, Open Access Journal of Contraception, 2015, 6:65­–75. 7. Riley C et al., Getting to FP2020: harnessing the private sector to increase modern contraceptive access and choice in Ethiopia, Nigeria, and DRC, PLoS One, 2018, 13(2):e0192522. 8. Winston J et al., Impact of the urban reproductive health initiative on family planning uptake at facilities in Kenya, Nigeria, and Senegal, BMC Women’s Health, 2018, 18(1):9. *Based on data for Western Africa as a whole. Country-specific abortion safety data for Nigeria are not available. Unless otherwise indicated, the information in this fact sheet comes from special tabulations of the data underlying Guttmacher Institute, Adding it up: investing in contraception and maternal and newborn health, 2017, Fact Sheet, New York: Guttmacher Institute, 2017, https://www.guttmacher.org/fact-sheet/adding-it-up-contraception-mnh-2017, and FP2020, Core indicator estimates: FP2020 2017–2018 progress report, 2018, http://progress.familyplanning2020.org/sites/default/files/FP2020_2018_FullEstimateTables_ONLINE.xlsx. We would like to thank Uwemedimo Esiet, Action Health Incorporated; Adenike Jagun, Track20 Project­–Avenir Health; and Lucky Palmer, Ayodeji Oginni, Babatunde Palmer and Hauwa Shekarau, all of Ipas Nigeria, for their review of this fact sheet. This fact sheet was made possible by support to the Guttmacher Institute, including UK Aid from the UK Government and grants from the Bill & Melinda Gates Foundation and the Dutch Ministry of Foreign Affairs. The views expressed are those of the authors and do not necessarily reflect the positions and policies of the donors.